Long before Ty and I called Merida home we became aware of a dog sanctuary in the nearby community of Uman . We found them by chance while scouring the internet for information about Merida. On Evolucion’s website, we saw the pictures of rescued dogs, and decided because we were in Texas and could not physically volunteer, to offer financial donations to help the dogs of Evolucion. As human beings who domesticated dogs, it is our responsibility to treat companion animals with respect and dignity. We must be advocates for those who have no voice. We believe this is the reason many of us have in the past and many still continue to support Evolucion. We want to be part of the solution to improve the lives of dogs. We simply love dogs. We believe the hearts of the local and expat communities are sincere in this. Here is our personal story. 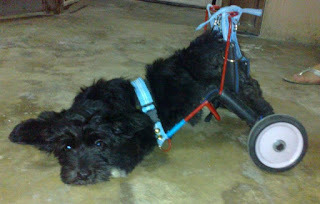 His name was Panque, he was an adorable little ball of black fur, wheeling around in a doggie wheelchair. In June of 2012, the Evolucion FaceBook post asking for a “forever home” for Panque tugged at our heartstrings. 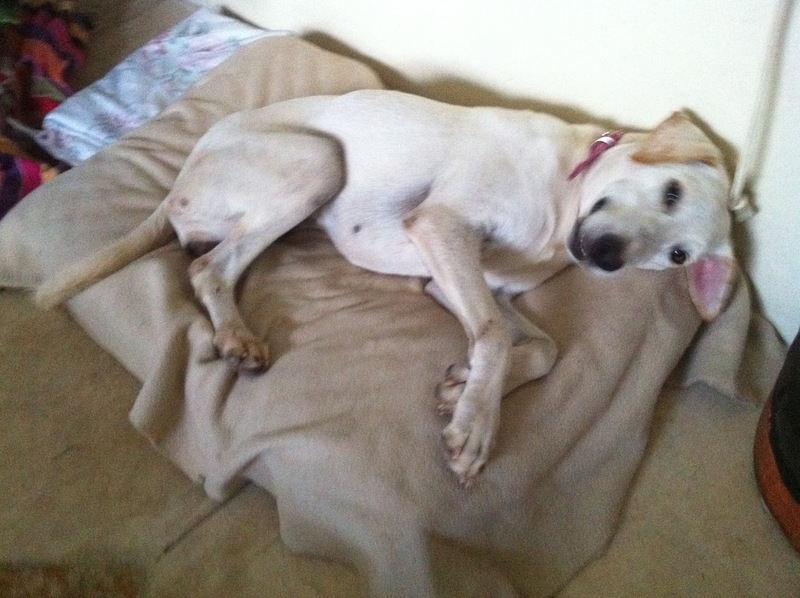 At the same time, we responded by fully funding a plea by Evolucion to cover amputation costs for a dog named Paty who had a severely deformed back leg. A friend and volunteer offered to bring Panque to us for a meeting; she was certain we would be perfect parents for the little dog in a wheelchair. However, we continued to decline this meeting. While reviewing the “Panque” post one more time, I phoned Silvia Cortes to ask for the address of the foster home where Panque was staying. The strong order of urine and feces filled the air as I approached the house and knocked on the iron protector. The door opened and I was greeted by a dozen or so large dogs and little Panque in his wheelchair. I realized this was not a “Foster Home”, but rather a location with a hired male worker where dogs were being housed. Seeing the conditions this little dog was in, I decided to phone Silvia and let her know I was taking Panque directly to the Veterinarian for evaluation. We committed to adopt Panque although there were never any adoption papers. I was unsure what would be found under his feces matted fur. When we arrived at the clinic, I was surprised the Vet knew Panque, Dr. Tony of Planned Pethood made it clear to me after his initial examination of Panque for Silvia Cortes he had informed her his birth defects were untreatable and he should be euthanized. At my request, Panque was given another exam, grooming and new X-rays. In my desire to help this dog, it was hard to accept the hopelessness of his situation. We changed his name to Rico which means “Noble Ruler”. For the next four and a half months we loved and cared for that sweet little boy. He had no use of his back legs and required around the clock care. While under the care of Evolucion he been allowed to drag himself around which had worn the tissue on his legs down to the bone (in fact the bone was worn flat), being left in the wheelchair for extended periods of time, the straps had left lesions on his legs. Once he had the matted coat removed it was obvious he was malnourished. He was incontinent and slept in diapers. Every time he urinated we removed his dirty bandages, washed the urine off his legs, dried him and wrapped his legs with new bandages. We consulted two local veterinarians, one in Cancun and another at A&M University Veterinary School in Texas about Rico’s condition. We requested a meeting with Silvia Cortes and three volunteers of Evolucion. During this meeting, Silvia and the volunteers agreed Evolucion did not have the facilities, staff or finances to care for a dog such was Rico. No explanation was offered as to why Silvia had not followed Dr. Tony’s recommendation. Many ideas for improvement were discussed. The volunteers and Silvia met later and an outline was created to implement necessary changes. Records would be kept, and Veterinarians recommendations would be followed. Dogs to sick too be cared for properly or were deemed not adoptable would be euthanized. We were assured by Silvia and the volunteers that changes in Evolucion policy would take place. Rico passed away with dignity in my arms on October 12, 2012; we were broken hearted. Amigos de Rico was founded in memory of our little Rico simply to help dogs. In the last three and a half years we have learned much and have needed to change many of our original beliefs to be more effective as we faced the overwhelming task of neglected and abused dogs in Yucatan. The one thing that has not changed and will remain is our desire to support organizations and individuals who work tirelessly to improve the lives of dogs in Yucatan. In late October, after Rico’s passing, we inquired about Paty and how she was getting along following her amputation. We were shocked to discover in the five months since her procedure had been paid in full she had not yet had the surgery. 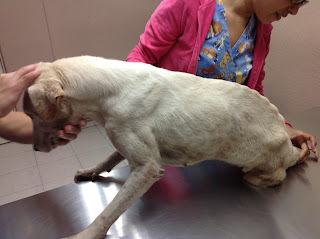 We were informed she was underweight and anemic and not strong enough for the surgery. Rather than care for her anemia, she was neglected and forgotten. Under Evolucion’s care, she was needlessly forced to drag her deformed leg an additional five months. We can only speculate what might have happened had we not checked on her status. At our own expense we requested Sylvia bring Paty to Pet Chalet a local dog care center, we provided home cooked food, kibble and iron supplements, and with the commitment from Pet Chalet we prepared Paty for surgery. In two weeks her weight and anemia improved and she was able to undergo surgery. A task Evolucion did not accomplish in five months. We paid for her to rehab after surgery at Pet Chalet. Through all of this, she remained the property of Evolucion. By this time, we had made a significant financial investment in the health and welfare of Paty. During the months Paty was at Pet Chalet our other dog Adie had been diagnosed with cancer. Adie and I were making frequent trips to a Veterinary Oncologist in Houston for treatment. It was not an option for us to adopt Paty at that time. After six months at Pet Chalet and no viable offers for adoption, Paty was returned to the Evolucion facility a healthy, happy dog! On January 22, 2014, I drove to Evolucion in Uman to meet with Jeff Damon, Dr. Jeff Young and Steve Goward Of Dogs Trust. Jeff Damon and I were developing a training program for adoptive dogs. Steve Goward was here on request from Dr. Young to professionally assess, evaluate and advise the animal shelters on the Yucatan Peninsula. This was the day he was to evaluate Evolucion. Upon arrival I asked to see Paty. At that point, she had been back at Evolucion for seven months. A male worker entered a large oval fenced area with a concrete pad, and 30 or so large dogs. He brought Paty out of a room attached to this fenced area. As she labored to come to me, I could see her ribs. I could see her protruding vertebrae. She had skin lesions. As she raised her head to smell me, I could see the pain in her eyes. She only took a quick whiff and turned to hobble back to the room. I gasped at the sight of her missing tail, red, inflamed, oozing, with the bone exposed. Her thighs were coated in a layer of watery diarrhea, flies hovering above her. She was in desperate need of immediate medical attention. I insisted Sylvia bring Paty out for Dr. Young to examine (he had performed her amputation), Sylvia did bring Paty out after my third request, and after she had cleaned off the feces and bandaged the tail. 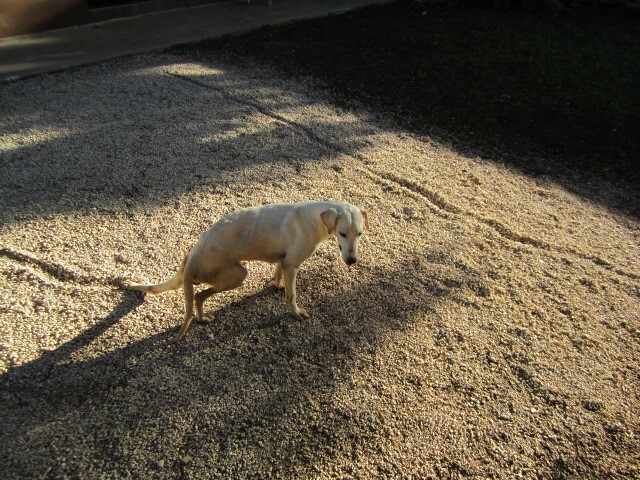 Sylvia never responded to my questions about what had happened to her tail or how a dog who had an online sponsorship could be allowed to get into this kind of shape (we were told by local expat business owners that they were Paty’s online sponsors). Once again I found myself rescuing a dog from the rescuer. On the drive to Planned Pethood, given the shape she was in I was certain euthanasia would be recommended. She weighed just 20 pounds. However, she had emergency surgery on her tail that very day. With the exposed bone she was at risk of her spinal cord being compromised. That fateful day she started the long road to recovery. After four months, four surgeries, treatment for internal and external parasites, internal and external bacterial infections, eye infection and ehrlichiosis, we were able to bring this sweet girl to her new forever home. We vowed to never allow her to suffer again. During the time of Paty’s treatment we once again found ourselves in a meeting with Silvia discussing the neglectful treatment of a dog under her charge. We asked for Paty’s records, which we have never received. It was at this meeting which also included Patricia Holland, when we asked about Paty’s tail, We were told by Silvia that Paty had chewed off her own tail. Can you imagine the emotional and physical suffering a dog would be under to perform this kind of self mutilation? Google it, it is quite disturbing. The last words Ty said to Silvia Cortes and Patricia Holland were, “this cannot happen again”. Under Evolucion’s care Paty did not deteriorate overnight, it took seven months. Silvia Cortes, Patricia Holland and the volunteers of Evolucion made a conscious decision to look the other way. They made a conscious choice to ignore her suffering. We are certain she would not have survived had I not found her that day at Evolucion. She would have died a sick, painful, stressful, sad and lonely death. Is this the “natural” death Paty could have suffered? In our home today she is a happy, healthy and loyal 38 pounds. In October 2010 we fully funded the building of a bodega to store the dog food on the grounds of Evolucion, at a cost of $1800 US. At our urging, family members also made contributions. All I can say is ‘wow!’. Your generosity along with that of Ty and Sara has been amazing. Through your family’s contributions we have been able to substantially improve the kennels and create a storage facility to house medical supplies and the 23+ bags of dog food that are delivered weekly to our sanctuary. Dear Sara the dewormers were bought today and we already have them in the shelter. I simply have no words to let you know how much I appreciate this and what a great help this is, we can deworm all our dogs in all their areas at the same time which means an optimus result in the shelter. Thank you, thank you so much, your help has meant a lot of improvments in our dogs life. Twice we paid to deworm the 180 dogs at Evolucion at a cost of $900US. We also made monthly donations of $100 per month online. We also donated $10,000MXP to complete the construction of the quarantine building. I could go on as many more cash donations were made as well. Please do not misunderstand our public disclosure of contributions as boasting, I have only included this information to make it clear that in the past we have been avid supporters of Evolucion and have a long history with Silvia Cortes, Patricia Holland and Evolucion. Some of our friends and fellow expats have completed successful adoptions and have positive volunteer stories. Our concern and the concern of many is the inability, due to philosophy, to control the number of dogs in Evolucion. The dogs who require care beyond Evolucion’s capabilities, dogs whose health is compromised when professional advice is not heeded, dogs who do not receive proper medical care, dogs who are warehoused off site, dogs hidden in rooms such as Paty, which a casual volunteer might never see, and dogs who in the past, Silvia and Evolucion have not responded to with effective care. Neglect and suffering is the direct result of housing more dogs than a shelter can adequately care for. 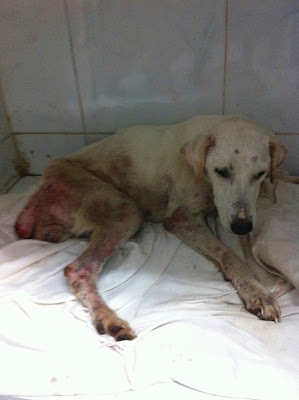 It is not just the dogs who suffer when an organization neglects dogs to the point Rico and Paty were neglected. People suffer! Children who visit Evolucion and see the overcrowded conditions, and the dogs who go untreated may come to believe this treatment of animals is acceptable. The veterinarians suffer while walking a line of commerce and empathy. Silvia suffers, and the volunteers suffer. Is it possible loyalty to the organization takes precedence over the welfare of the animals under their care? The culture of Yucatan suffers as the organization offering education for proper animal care is guilty of the offenses they teach against. And we, as an expat community suffer, when we stand divided, when standing together we would be more effective. Ty and I have suffered the anger, the grief and the hopelessness of Rico. We suffered the anger, and senselessness in Paty’s neglect. We have suffered the guilt of not demanding justice for Paty. Finding a solution to this ongoing problem is difficult, we have had two meetings with the leaders of Evolution and yet the problems and ineffective policies continue at the expense of some dogs in their care. I believe as a community we all truly want to find a solution. As an organization who exists solely on donations. We should ask for public transparency from Evolucion with their financial and medical records. We should ask for public disclosure of off site foster homes and dog warehouses. We should ask for new and effective policies to be implemented. The donors should require enforcement of these policies. Money speaks loudly. In January 2014, we and Amigos de Rico withdrew future financial contributions and no longer support Evolucion or Silvia Cortes in good faith until effective policies are instituted and enforced. Amigos de Rico did complete our commitment for the spay and neuter clinics. The above philosophy did not hold true for Rico or Paty. Sadly, Rico and Paty suffered neglect to the point of abuse in the hands of an organization who should have been their advocate. We were committed with financial contributions and Evolucion did not act responsibly and have not been transparent and accountable. The issue for us is trust. I ask you, if we are just one family who happened upon not one, but two dogs who were improperly cared for by Evolucion, how many others do we know nothing about? Thanks so much for this very clear, straightforward account. Improving animal welfare is not easy; we need to work together, and this includes facing up to the bad and ugly, along with the good. I hope that Evolucion and its supporters can recognize that helping includes accepting criticism and making changes. This is an incredible and sad story. I believe you are as fair and impartial as anyone could be! Generosity and animal love is obviously your main objective, and I hope many people read this!!! Thank you for your support, we just want to see things get better!